Health Workforce Australia recently predicted that by 2025, there will be a shortage of 109,000 nurses in Australia. Across the healthcare sector, employers are looking for skilled and experienced staff making now an excellent time for healthcare workers to consider migrating to Australia. You could come for a few years to work and enjoy the lifestyle, or as a permanent move. Australia has an excellent reputation for high quality healthcare services. Health workers in Australia work in public and private hospitals, small and large private practices, and through a range of community health centres and services. Dentist; Sonographer; Occupational Therapist; Dietitian; Physiotherapist; Audiologist; Speech Pathologist; Social Worker; Podiatrist; Clinical Psychologist; Medical Diagnostic Radiographer; Registered Nurses; Midwife. I’m already qualified as a nurse, can I work in Australia? To work in Australia as a nurse, you must be registered with the Nursing and Midwifery Board of Australia and meet the Board’s registration standards. You might also need to complete a skills assessment from the Australian Nursing and Midwifery Council. We can help advise on pathways to start your nursing career in Australia. 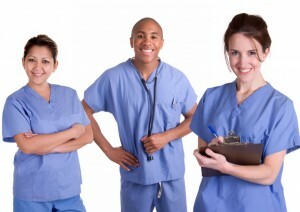 Please click here for more information about Skills Assessments for Health Care Workers. The Australian Health Practitioner Regulation Agency sets out detailed requirements to allow people who qualified overseas to work in Australia. We will help you understand their detailed requirements. #The English Language Skills Standard means internationally qualified applicants who did not complete their secondary education in English must demonstrate that they have the necessary English language skills for registration purposes. test results to be obtained within two years prior to registration application. For more information about how to get your skills recognized, please click here. What does an Australian visa cost? The costs for an Australian visa depend on the type of visa and a range of other factors. The following are some examples but please contact us for a detailed explanation. Our fees to advise you, lodge your visa and handle every stage of your application start from A$2500. We will always give a detailed explanation of all fees and charges up front and provide a client agreement disclosing all relevant information. When considering the costs of an application, it is worth remembering that average wages in Australia are much higher than many other countries and suitably qualified people can earn a good salary. Healthcare workers in Australia generally enjoy good terms and conditions and favourable salaries with support and training to develop their careers.